Jan 8, 2019 - A nine-year-old girl in Japan will become the youngest-ever professional player of the strategy board game go when she makes her debut later this year. 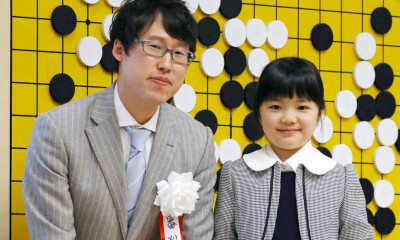 Sumire Nakagawa, who attends primary school in Osaka, started playing go at the age of three and will start her career at the lowest rank of shodan on 1 April, according to Japanese media. She will comfortably beat the record for the youngest professional held by Rina Fujisawa, who was aged 11 years and six months when she turned professional nine years ago. Nakagawa, who was encouraged to play go by her father, Shinya Nakagawa, himself a ninth-degree professional player who won a national title in 1998, is the product of a special programme to nurture a new generation of top Japanese players who can compete with their Chinese and Korean counterparts in international tournaments. The primary school pupil honed her skills at tournaments involving other schoolchildren and recently sharpened her competitive edge in South Korea. Go, which requires players to take control of territory on the board, is said to have originated in China more than 2,500 years ago and has an estimated 20 million active players, mainly in east Asia. Fans of go will be hoping that Nakagawa’s extraordinary rise will boost interest the game, in the same way Sota Fujii did for shogi, a Japanese version of chess. Fujii set a record for consecutive victories in professional shogi in 2017, aged just 14, winning plaudits from the prime minister, Shinzo Abe, and sparking a surge of interest in the game. Last month, Fujii won his 100th official match, becoming the youngest professional player to reach the milestone. He also completed the feat faster than any other player.